Exceptionally smooth filtered cigars which are expertly crafted with the outmost care and expertise in premium tobacco products. 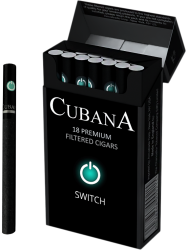 The "Treasurer London" Cubana is the first filtered cigar with a menthol capsule. 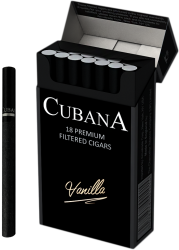 There are 3 varieties of Cubana: Clove, Vanilla and the Switch which has a menthol capsule. 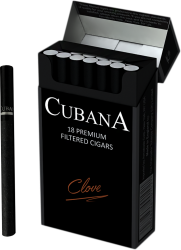 A very high quality tobacco is wrapped in a special black cigar wrapper of reconstituted tobacco paper which is made specially for Cubana cigars.